Drawing the conclusion that the tenure of New York Islanders’ GM, Garth Snow, has been rocky would an understatement. At times, Twitter is ripe with people wondering why he still has a job. The Nino Neidereitter trade certainly was not great as Cal Clutterbuck could have come for less. Free agents have walked (Kyle Okposo, Frans Nielsen) but there are more factors at play when a player chooses to sign elsewhere. Many in the hockey world are wondering about the future of star center, John Tavares, but it appears there is more reason to stay now than to go to the highest bidder, as the Islanders are heading in a better direction after acquiring a couple of nice pieces. One of those pieces has picked up steam early in the season and is a key factor in the team’s improvement: 20-year old forward, Mathew Barzal. With 36 points in 39 games, and a 54.7 CorsiFor% at even strength, the former Seattle Thunderbird has been the second-line center that the Islanders have sorely needed. Having Jordan Eberle and Andrew Ladd on the wings has helped create balance in scoring as Tavares solidifies the obvious top line with Anders Lee and Josh Bailey. As a 16th overall selection (from a swap with Edmonton for defenseman, Griffin Reinhart-yes this has turned out to be a steal) in the loaded 2015 NHL Draft, Snow and the scouting staff were aware of the talent but understood that development was needed before making the big leap to the NHL. And after two more seasons in major junior, Barzal made an impression on the coaching staff as they inserted him in a top-six role where he has given no reason to be demoted. When a player is selected lower than others yet has a stronger impact, I always wonder if there are managers and staffs questioning if they made the right decision by opting for a higher pick. With 15 selections prior to Barzal, did some NHL teams miss on an opportunity? No: Does anyone really need to explain this? When a generational player is available, saying no is similar to rejecting an offer of a first-round pick for Ryan Reaves. It will not happen. Even Peter Chiarelli will make this move. That’s how easy a decision it was. No: Barzal may have more points at this very moment but Jack Eichel would be picked first in any other draft class since Sidney Crosby. Some still consider Eichel a generational talent where some, at worst, see him as an elite, top-line center. Whether Barzal can become a number one remains a question and the Sabres were not going divert from their plan to be guaranteed the second pick. No: This one is a little tougher as I did not have Strome as high as the “experts.” It is true, this kid blew up the OHL with great offensive statistics but his skating is not much better than Sam Reinhart’s. Strome had the definite size advantage over Barzal and higher potential of being a top-line center, which was needed by the Coyotes. In that position, it is hard to say no. No: With stats only slightly lower than Strome, I had Marner at this spot pre-draft and as the better player. The former London Knight has elite offensive skills that are undeniable and the Leafs were very much in need of. As a small forward, Marner stood out in terms of speed and ability which has translated nicely to the NHL. At times on the fourth line, he has still managed to accumulate 29 points in 39 games while being versatile enough to play wing and center. Some wonder if Mike Babcock is holding him back as certain players have received more ice time that they should (Leo Komarov, Roman Polak). Yes: Noah Hanifin has not had the immediate impact that the Hurricanes would have liked though he has improved in offensive production (20 points in 38 games) in a sheltered role. There is a strong stable of defensemen in Carolina and they could have used a forward that can produce more consistently. Barzal has more points than anyone on the Hurricanes and certainly would have been a nice addition to a team that is first in CF%. Now that Hanifin occasionally hits the trade rumors, Barzal would have been a better choice even though it took two more years of development. Yes: Zacha’s size and tenacity impressed scouts though he was not overly productive as a junior player after moving in from playing professional hockey in the Czech Republic. He had dropped 3 spots in CSS final rankings and I thought he could have dropped more. The Devil has 37 points in 102 NHL games while Barzal has one fewer in 39 games. Zacha is an example of a “physically mature player” not necessarily meaning “NHL ready” as many teams have assumed over the years with forwards of similar profile. No: The Flyers needed a stud defenseman of the future and they selected one with Provorov. A team with a fair amount of good forwards in the system needed better support on the blueline. As a 20-year old playing over 25 minutes a night, he has faced challenges but was in the trap of too good for junior yet could use a little more seasoning before the NHL… and the CBA prevented him from playing in the AHL. Though Zach Werenski would have been my choice, Provorov would be the next. No: Like Philadelphia, the Blue Jackets needed another good defender in the system as Ryan Murray has been oft-injured and not what was expected as a No. 2 pick. Zach Werenski was my top-rated defender of this draft yet he slipped to 8th. Statistically, he was better than Hanifin in NCAA but needed at least one more year to fine-tune his game, which worked since he had an immediate impact. Now, Barzal would have been a great selection for Columbus as they could use talented forwards but passing on Werenski would have been a mistake. Having added Artemi Panarin at the end of 2017 has been a solid alternative. Yes: The Sharks are not getting any younger and they did need some help on the wing. This is a team, however, that is not afraid to move forwards to center, then the wing, and then back again. Barzal is not as heavy a player as Meier but could move to wing, if necessary, and probably have more of an impact. Logan Couture, oft-injured, is coming up on 29 and Joe Pavelski, now 33, are a talented tandem but will need a succession plan. Adding another young center to the group would have been in their best interest but the Sharks thought otherwise. Yes: The truth is: the Avalanche needed quite a bit. Ryan O’Reilly was traded, along with Jamie McGinn, to the Buffalo Sabres for Mikhail Grigorenko (KHL), Nikita Zadorev, J.T. Compher, and a second in 2015. Taking the No. 1 ranked European player is not so bad and Rantanen had done well in the AHL, putting up 33 points this season. Developmentally, they are at about the same level but with Barzal’s contribution still larger. Colorado is in last in the stacked Central Division, with little to rave about down the middle. With Matt Duchene traded to Ottawa, I believe that Barzal could fill the void, especially if Nathan McKinnon is at center. But again, that is counting on Joe Sakic, a fan favorite as a player, to do the right thing as GM. Yes: The Panthers did need wingers, with Lawson Crouse being the next logical choice as he dropped. Crouse had been rated top-five amongst North American skaters due to his superior athleticism and size. Underwhelming offensive production forced the first-ten clubs to look elsewhere, allowing for Florida to pounce. A year later, however, Crouse was sent packing to Arizona where he has 13 points in 81 NHL games. Ice time has been lower, with a stint in the minors this season, as he is not ready for top-six minutes. Florida may have gotten far value for Arizona taking a bad contract in Dave Bolland but was it worth not selecting Barzal at 11? Or would he have just been traded to the Coyotes as well? Panthers GM Dale Tallon and Co. are not doing a lot right and certainly did not help themselves by picking Lawson Crouse. Yes: I almost did this one with all caps as this was a big miss by the Stars scouting staff. Gurianov at 12th was a reach on the part of the organization as he was not a top-five ranked European skater. Solid MHL numbers had him ranked in the top-ten in this field but he certainly did not out rank the likes of Joel Eriksson-Ek (Minnesota). The 20-year old Russian has not exactly hit the ground running with the Texas Stars (AHL) and is a project at best. Some players take time but to overlook Mathew Barzal and reach so far down is holding Dallas back versus pushing them further in the Central Division. Yes: I lump these next three picks together as Bruins GM Don Sweeney executed trades that landed three, consecutive first-round picks. When you have this much freedom, and you do not pick Mathew Barzal, you have failed. I mean, you have the 15th selection and you take someone rated to be taken on day 2 instead of the talent to be had that is, you know, better. Debrusk has not been too shabby in his debut while Zboril and Senyshyn continue to develop. That may have been the plan but that still does not make it look any less foolish. Barzal would be the leading scorer on the Bruins had he been playing now and they could have used one of three picks in the second round on Senyshyn. This may have been the worst evaluation of talent for any one team in their position. Scouting is not an exact science but how many times does a team pick the “big guy” over the “small guy” before realizing that is not necessarily the way to view players. 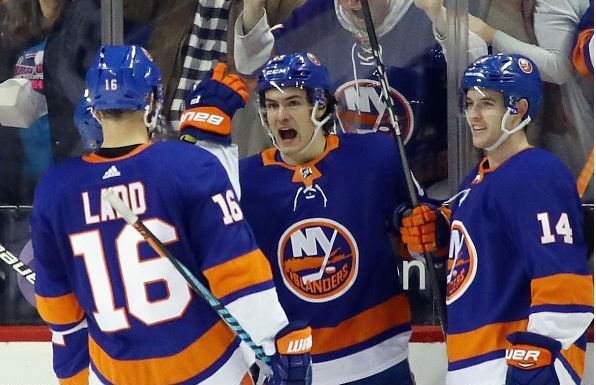 Speed is the name of the game in the NHL and Mathew Barzal can bring what is needed to succeed. GM’s are often too proud to admit it but Barzal may not have left the top-five if he was valued for what he is versus what he is not. In real life, there are no reset buttons. With that in mind, Garth Snow is undoubtedly pleased he did not hesitate when selecting the player that Boston passed on three times.